Advocates agree that the best way to prepare for an IEP meeting for your child is to bring along an IEP Notebook. I alway advise my clients to create two IEP Notebooks. The Glossary is filled with 78 pages of Special Education terms that you may be unfamiliar with, or unfamiliar with as they apply to material regarding IEP’s. 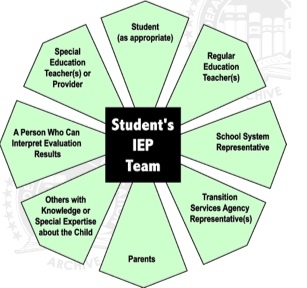 This is a PDF file that is available for download and print out and may be immediately be inserted into your IEP Notebook. Dore E. Frances, Ph.D. continues her wonderful profession as an advocate and educational / therapeutic consultant. She is covering many subjects for parents on blogs and is preparing other downloadable information that can be readily used for IEP meetings. Dr. Frances was able to receive an 80% payment of residential treatment services for 2 years for her daughter as well as retroactive monies that had been denied. Her IEP Notebook, used at Mediation, was 500 pages. The State Mediator was so impressed with the thoroughness of the 500 page IEP Notebook and documentation, she asked permission to use it as a training tool.